A combination of classy football and sheer determination saw Eastbourne Borough through to the first round proper of the FA Trophy. Borough advanced thanks to a thrilling and hard fought 3-2 replay victory at a wet and windy Dartford on Tuesday night, after the two teams drew 1-1 at Priory Lane last Saturday. Victory earned The Sports £5,000 in prize money as they entered the last 32 of competition and they are now just five matches from a Wembley final. Borough will host Dorchester, who are 18th in Evo-Stik Southern Premier League South, on December 15. Two goals from Dean Cox gave Borough the lead at Dartford on Tuesday but the hosts came back with two late goals from Coker and Onyemah. With extra time and possible penalties looming, Jamie Howell’s determined team produced one last effort and with almost the last action of the match, Tom Gardiner claimed the winner with an excellent 94th minute header. “I was delighted for the players and they fully deserved it,” said Borough boss Howell. “We played some of the best football since I have been here, especially in the first half. “We got the two goals but if I am honest, I never felt relaxed and that is an indication of where we are at the moment. “We play some great football but seeing things through and managing the game is where we are lacking at the moment and that comes down to experience. “Dartford got the two late goals but the lads then showed great spirit and desire. It would have been easy for us to throw in the towel but we kept going and Tom’s header was a great one, a deserved winner. It was nice to have a late winner goal go our way fro a change. We have been on the receiving end of a few and at last, that little bit of luck went our way. “For some of the players to be involved in that was a great experience. We will look at what we did well and what we did wrong and learn from it. We are a team in progress, I know that and so do the players. We are learning but the important thing for me is that the players what to learn and want to improve. The attitude is good. 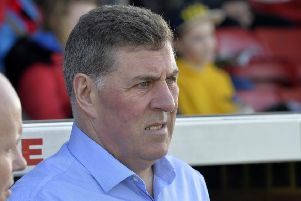 Howell guided his previous team, Bognor Regis, to the semi-final of the FA Trophy in 2016 and witnessed first hand how this competition can galvanise the club and the town. It’s a great competition and we showed on Tuesday exactly what it means to us. It can have a positive impact on many levels. It helps the younger players, it lifts the fans and it can help bond the club with the town.